Home > Robotics > How will mobile robots transform material handling industries? By 2027, mobile robotics in material handling and logistics will have become a $75bn market. It will then more than double by 2038. These staggering headline figures mask turbulent transformative change underneath: some technologies will rise and transform the fortunes of industries, fuelling growth rates far outpacing recent trends, whilst others will face with decay and obsolescence. We are at the beginning of the beginning of a transformative change, and the time to plan is now. The IDTechEx Research report Mobile Robots & Drones in Material Handling & Logistics 2017-2037 focuses on all aspects of mobile robotics in material handling and logistics. In particular, we consider the following: automated guided vehicles and carts (AGVs and AGCs); autonomous mobile vehicles and carts/units; mobile picking robots; last mile delivery ground robots (droids) and drones; and autonomous trucks and light delivery vans (level four and level five automation). We provide technology roadmaps and twenty-year market forecasts, in unit numbers and revenue, for all the technologies outlined above (11 forecast lines). We built a twenty-year model because our technology roadmap suggests that these changes will take place over long timescales. We further provide investment/trend analysis and company interviews/profiles/reviews. Here, in this rest of this article, we will briefly highlight the major changes that our report anticipates. These figures show a short-term as well as a long-term view of the market evolution. 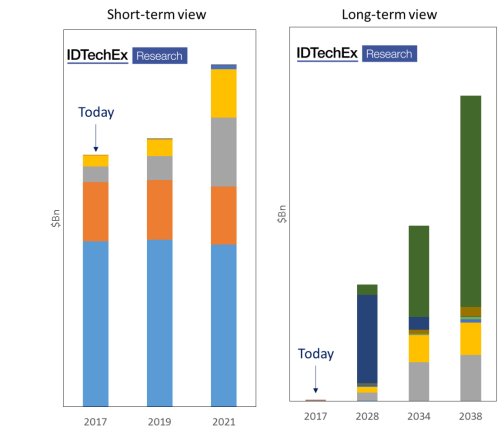 Each colour refers to a different technology, demonstrating how the market composition will completely change in the coming years and how technology improvement (rise of autonomous mobile robots) will bring significant new revenue into the industries considered. We are at the beginning of the beginning of a transformative change, and the time to plan is now. This figure includes automated guided vehicles and carts (AGVs and AGCs); autonomous mobile vehicles and carts/units; mobile picking robots; last mile delivery ground robots (droids) and drones; and autonomous trucks and light delivery vans (level four and level five). Note that the headline figure quoted above is at the level of complete autonomous vehicle. We also provide forecasts at the automation-only level where appropriate (e.g., autonomous trucks). This gives an illusion of security to this mature high-fragmented business where price competition is rise. The next-gen navigation technology- infrastructure-independent flexible autonomy- has the potential to shatter this illusion. This new technology, whilst appearing just as the next natural step in navigation technology evolution, requires a wholescale change in the software side of the robots, giving an opportunity to new challengers to enter and to fully redraw the competitive landscape. Our report Mobile Robots & Drones in Material Handling & Logistics 2017-2037 provides a detailed and quantitative (revenue and unit numbers) assessment, forecasting how sales of AGVs will grow then decline in the next twenty-years. In addition, it will show how autonomous mobile robots (AMRs) will rise, not just largely replacing AGVs but in time diffusing beyond the structured confines of warehouses and factories. Navigational autonomy will induce a colossal transfer of value from wage bills paid for human-provided driving services towards spent on autonomous industrial vehicles. This, in turn, will fuel the growth in this material handling vehicle industry (e.g. forklift), creating significant revenues over a business-as-usual scenario. This is despite our technology roadmap showing that hardware commoditisation will slowly devalue such driving services particularly in high-wage regions. AGVs barely made a dent in this industry. This is because their navigational rigidity put a low ceiling on their total market scope, keeping them as a small subset of the warehouse/factory automation business. Autonomous mobile robots are radically different however because they will ultimately enable automation to largely keep the flexibility and versatility of human-operated vehicles. Our technology roadmap in the report- Mobile Robots & Drones in Material Handling & Logistics 2017-2037 - suggests that this change will not happen overnight, explaining why we have built twenty-year forecast models where each phase of market evolution is justified. They will, however, take place much earlier than mobile autonomy in general driving since the structured and controlled environment of indoor industrial facilities lends itself better to automation. This trend may not yet be on investor presentation of big, say, forklift suppliers, but will inevitable rise up the agenda as a key feature of the industry for years to come. In our report Mobile Robots & Drones in Material Handling & Logistics 2017-2037 we provide a forecast model showing how mobile picking unit will evolve going through different phases of performance (sub-human, approaching human, and potentially exceeding human) over a twenty-year period for both regular and irregular/mixed shaped items. We provide forecast in unit sales as well as revenue. We further include company overviews/interviews as well as technology analysis. Our report Mobile Robots & Drones in Material Handling & Logistics 2017-2037 details a quantitative picture, in unit numbers as well as revenue, of the emergence of last mile delivery mobile robots over the coming two decades, clearly explaining the different phases of evolution from trial/early commercial sales toward rapid market penetration and finally towards maturity and then revenue decline (our model shows that hardware commoditisation outpaces volume growth). Indeed, we find that delivery drone sales will remain limited until 2027/28. Demand will then start to taking off in remote or sparsely-populated (e.g. suburbs), ultimately enabling companies to establish large accumulated fleets. Despite their ultimate rise, however, drone delivery will remain only a small part of the much bigger commercial drone story. Trucking is a big business. In the US, the trucking industry revenues are in excess of $726bn. This is the equivalent of combined revenues of Apple, Amazon, Google, Microsoft, IBM, Baidu and then some (a lot) more. It is also a big employer: the US Bureau of Labour Statistics suggests that 1.79 million people work in this sector driving 7.2 million trucks for inter-city freight transport earning an average salary of 41.3k$/year. No wonder this is a hot topic now then. Trucking is also potentially an easier target than general passenger cars. This is because it spends much of its time in intercity roads which are less congested and less sinuous than city ones. The driver may remain in the vehicle, but the commercial inventive, even in this hybrid approach, exists because it may justify a relaxation of the rulebook which limits driving hours. This can therefore boost driver productivity and asset utilisation. Our forecasts and technology roadmaps show how different levels of automation (level four and five) will rise and fall in trucking over the next twenty years.